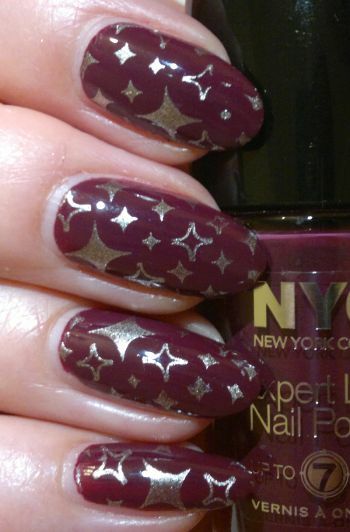 Alright… for this mani I painted my nails with NYC Expert Last 205 Boundless Berry (2 coats). I love this colour. It’s gorgeous! I thought about doing a glitter mani, but then I decided to stamp. I used Pueen‘s 100 stamping plate (which is part of Pueen‘s Make Your Day stamping plate set). 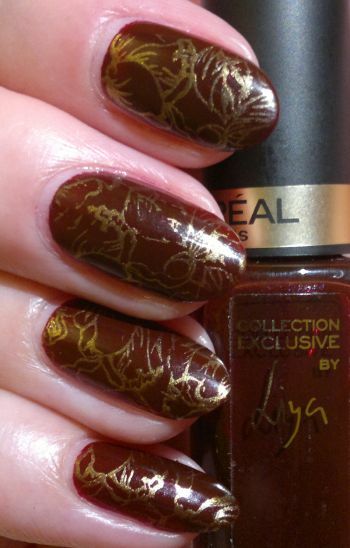 The gold polish I stamped with is the one and only Sally Hansen Complete Salon Manicure 819 Coat Of Arms. Hi there! This week is NAIL WEEK. This means that I’ll only be posting about manis that I did. 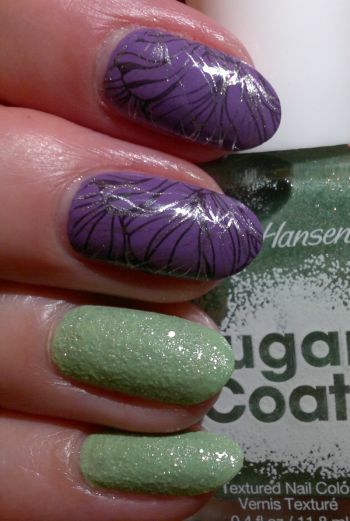 Alright… for this mani I painted my nails with Sally Hansen Complete Salon Manicure 820 Loden Green. I’m not a big fan of Sally Hansen’s Complete Salon Manicure collection because many polishes are super thin and poorly pigmented, but this one was opaque in 2 coats. Then I stamped! 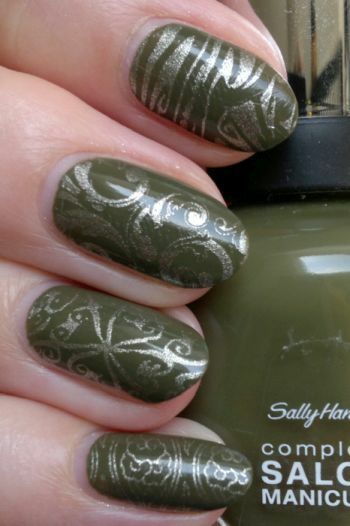 I used my JQ-L19 stamping plate and Sally Hansen Complete Salon Manicure 819 Coat Of Arms as my stamping polish. I was really happy with this mani. 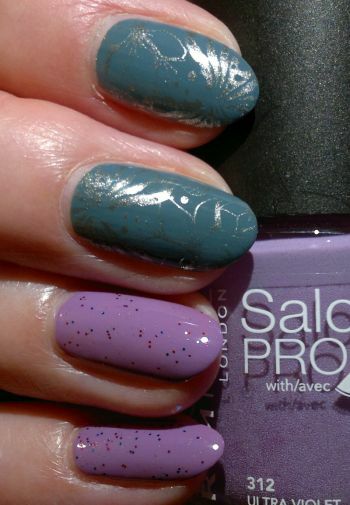 It wasn’t the most summery mani, but I liked how the 2 colours looked together. Hi there! Today’s post is about a mani I did just a few weeks ago. 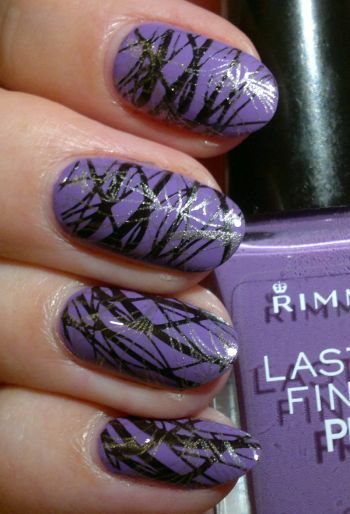 For this mani I painted my nails with Rimmel Lasting Finish Pro 370 Wild Orchid (2 coats). This kind of milky purple (aka bubble tea purple) is my favourite nail colour. Whenever I see a milky purple polish, I buy it! Back to the mani! I decided to stamp. Double-stamp, to be precise. I used Revlon Colorstay 270 Stiletto (black) and Sally Hansen Complete Salon Manicure 819 Coat Of Arms (gold) as my stamping polishes. The images are from Pueen‘s 114 plate (which is part of Pueen‘s Make Your Day stamping collection). I really liked this mani. 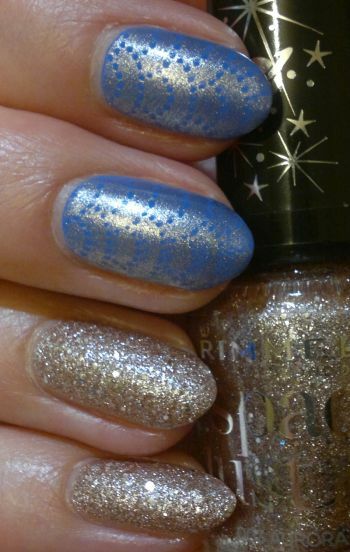 I’ve done a very similar mani before, so I knew what I could expect from this mani. Do you like nail stamping? If so, let me know. And if not, why not? What nail polish are you wearing at the moment? Feel free to comment. And thanks for reading!